Water-colour painting of Dindigul with an English officer, perhaps MacKenzie, and an Indian in the foreground. 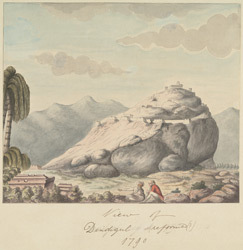 Inscribed on the front in ink is: 'View of Dindigul (?) 1790.'. This image is from the MacKenzie Collection.